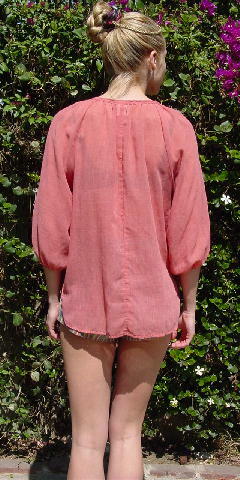 This vintage peasant blouse has 3/4 length sleeves with loose elastic at the ends. The front has a 5 1/4" opening extending downward from the neckline with 4 tiny iridescent peach buttons. It has a very wide jewel neckline. There is no fabric tag, but it's sheer and feels like a synthetic-cotton blend. There is gathering extending downward front and back from the neckline. It's in a light salmon color and it has 6" side seam slits with rounded edges. A stylist wore it during her pregnancy.